Here's my interpretation of a well-loved, old-fashioned dessert. 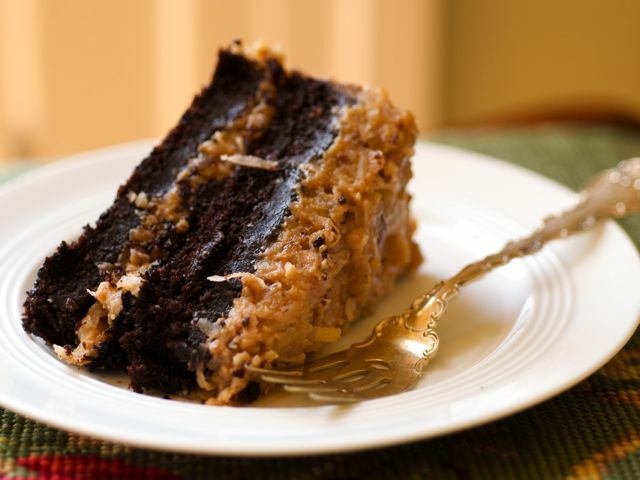 It's basically a simple chocolate cake with a coconut-pecan frosting. More often than not, I make half of the coconut-pecan frosting to use as a filling between the two layers, then frost the outside of the cake with chocolate ganache. Make the cake: Preheat oven to 350 degrees. Grease and flour two 9-inch round pans. In another bowl, mix together the buttermilk, eggs, brown sugar, oil, and vanilla until just combined. Add the wet ingredients to the dry and beat, either by hand with a large whisk or with an electric mixer on medium speed, for 2 minutes. Frost the cake: In a medium saucepan, whisk egg yolks with evaporated milk. Add brown sugar, butter, and salt, and cook over medium-high heat, stirring constantly, until it comes to a boil and is slightly thickened, 5 to 10 minutes. Remove from heat and stir in vanilla, coconut, and pecans. Transfer mixture to a bowl, cover, and refrigerate until cool, about 2 hours. Frost top of first layer and place second layer atop it. Frost top and sides of cake.